A pair of spacewalking astronauts successfully installed a new piano-sized camera in the Hubble Space Telescope on Thursday, the first step to making the observatory more powerful than ever. The repair job  all the more dangerous because of the high, debris-ridden orbit  got off to a slow start. John Grunsfeld and Andrew Feustel had trouble removing the old camera from the telescope because of a stubborn bolt. They fetched extra tools, but none seemed to work. Finally, Mission Control urged the astronauts to use as much force as possible to free the bolt. "OK, here we go," Feustel said. "I think I've got it. It turned. It definitely turned." And then: "Woo-hoo, it's moving out!" The effort put the astronauts a little behind schedule in their first spacewalk of shuttle Atlantis' mission. In all, five high-risk spacewalks are planned to fix Hubble's broken parts and plug in higher-tech science instruments. Atlantis and its crew are traveling in an especially high orbit, 350 miles above Earth, that is littered with pieces of smashed satellites. A 4-inch piece of space junk passed within a couple miles of the shuttle Wednesday night, just hours after the shuttle grabbed Hubble. Even something that small could cause big damage. For the first time, another shuttle is on standby in case it needs to rush to the rescue. Once the sticky bolt was freed, Feustel pulled out the old camera, the size of a baby grand piano. "This has been in there for 16 years, Drew," said Grunsfeld. "It didn't want to come out," Feustel replied. The spacewalkers followed up with the installation of the replacement camera. "Let there be light," Grunsfeld said as ground controllers checked the power hookups. Everything tested fine. Also on their to-do list: replacing a computer data unit that broke down last fall, and hooking up a docking ring so a robotic craft can guide the telescope into the Pacific years from now. The powerful new camera is about the size of a grand piano and 30 times more powerful than the old one. It will allow scientists the chance to look back more than 13 billion years to when galaxies were just starting to form, reports CBS science and technology correspondent Daniel Sieberg. "One of the holy grails of modern astronomy is to understand how stars first form and arrange themselves into the galaxies we see today," said CBS News space consultant Bill Harwood. Not only can the camera peer deep into space, but it's also multi-spectral - allowing scientists to make observations in the infrared, visible and ultraviolet spectra, NASA astronaut Mike Gernhardt told CBS' The Early Show from the Johnson Space Center in Houston. "It's a really special camera," he said. The old one was installed in December 1993 during the first Hubble repair mission, to remedy the telescope's blurred vision. It had corrective lenses already in place and, because of the astounding images it captured, quickly became known as the camera that saved Hubble. It's also been dubbed the people's telescope because its cosmic pictures seem to turn up everywhere. The camera  which has taken more than 135,000 observations  is destined for the Smithsonian Institution. Grunsfeld, the chief repairman with two previous Hubble missions under his work belt, took the lead on the camera replacement as well as the work to install a new science data-handling device. He sounded awe-struck as ever. "Ah, this is fantastic," he said as he floated outside, the bus-size telescope looming overhead. 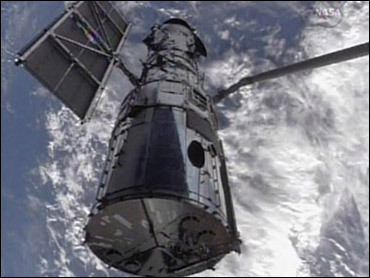 Hubble's original data handler, which was launched with the telescope 19 years ago, failed in September, just two weeks before Atlantis was supposed to take off on this fifth and final servicing mission. The breakdown caused all picture-taking to cease and prompted NASA to delay the shuttle flight by seven months. Flight controllers managed to get the telescope working again, but NASA decided to replace the faulty computer unit. The goal is to keep Hubble running for another five to 10 years. Another two-man team will venture out Friday for the second spacewalk.